Depending on where you are located in the Ohio, you may or may not have snow cover on your lawn. Although we haven’t had much snow this year, it can affect lawn care in Columbus, or lawn care in Cleveland. Snow acts as an insulator to the above ground leaf tissue. This can help protect your lawn from exceptionally cold winds. 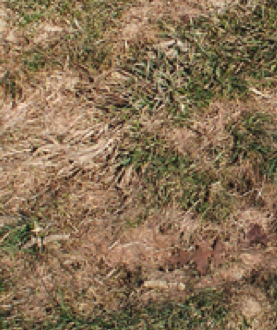 Cold winds can cause some winter injury to the less cold hardy grasses such as tall fescue. Snow can also create an environment for what we call snow mold. This is a disease that is triggered by the moist, humid, environment that a blanket of snow can create. Generally the snow cover will need to be around for a few days or longer and be present on unfrozen soils. To put it into a nutshell, we have very favorable conditions for this disease right now. Snow molds are often unsightly in the short term. Your lawn will most likely grow out of the condition in the spring after it is fertilized, aerated, and the growing season begins. Lawn diseases are an interesting topic. I will go over some of the basics in future posts. In the upcoming months, when the snow is gone, and the temperatures begin to rise, get out and take a look at your lawn. If you notice anything that looks like winter damage, take note of it and ask your lawn care company when they are in the neighborhood.